If your order weighs less than 13 ounces, save huge on shipping with USPS first class (with tracking number). This product weighs 4.8 oz. 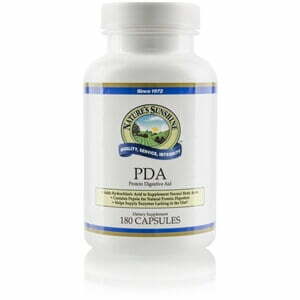 Nature’s Sunshine PDA Combination assists with the digestion of protein. As the body ages, the more difficult it becomes to digest protein, which could compromise the level of healthy bacteria in the intestinal tract. 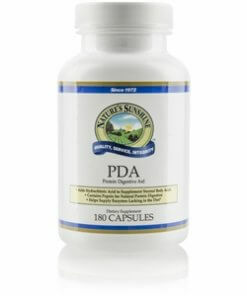 PDA Combination supplies betaine and pepsin, both of which promote healthy intestinal flora. Instructions: Take one to four capsules with a meal three times daily.